Both teams will wear specially-designed throwback jerseys when they play at Notre Dame Stadium on New Year's Day. 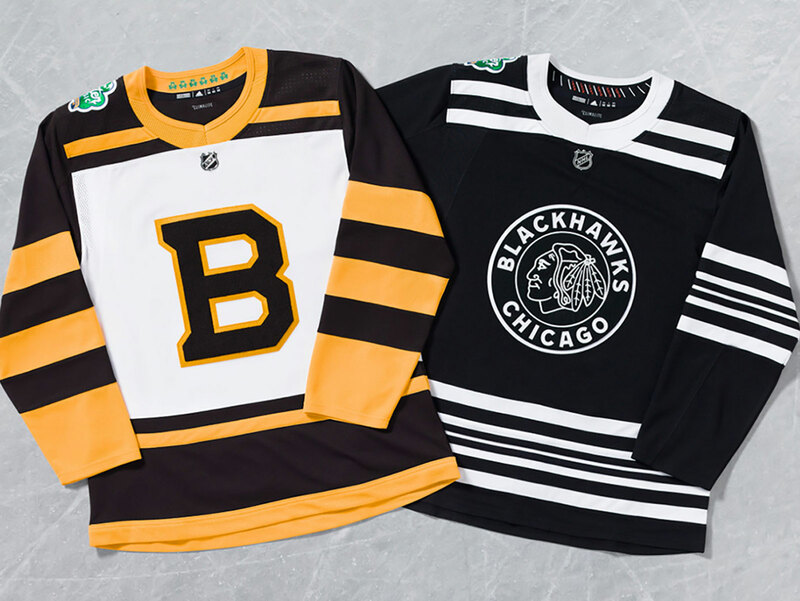 The Bruins and the Blackhawks unveiled their 2019 Winter Classic jerseys ahead of their New Year's Day meeting at Notre Dame Stadium. Both teams paid tribute to the history of their organizations and to their host, the Fighting Irish. The Bruins' brown and gold jerseys are a tribute to the team's 1930s era uniforms. The throwback look features Boston's classic "B" logo, the NHL Bridgestone Winter Classic emblem and a list of the years the team has won the Stanley Cup set within a shamrock—a nod to Notre Dame Stadium. The Blackhawks Winter Classic look plays off the team's 1943 uniform, the same year Chicago won its first Stanley Cup. The Blackhawks' special unis also feature their six Stanley Cup championships and the Notre Dame Stadium hash marks, the same pattern etched in the Fighting Irish's endzone. The #Blackhawks 2019 #WinterClassic jersey is available NOW at the @BlackhawksStore and @MadhouseStoreUC! The game is slated to start at 1 p.m. ET on Jan. 1, 2019.